The technology is being used in India for the first time, Coimbatore corporation official say. 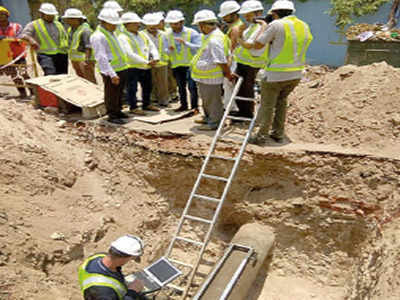 COIMBATORE: Suez Projects Private Limited, which is implementing the 24/7 water supply project in the city, is using cutting-edge technology to assess the condition of the old drinking water pipelines. “As a part of the project, the condition of the existing pipelines needs to be assessed to decide whether to replace them. We have decided to replace all the asbestos and PVC pipelines. The firm is using external acoustic condition assessment (e-pulse) and electromagnetic method (scanner) to check the condition of metallic pipelines, especially internal and external corrosion. The method is both non-destructive and non-intrusive,” a corporation official said. Of the 111km-long feeder pipeline, those in 55km are made of metal. “The scanner is placed on the surface of the pipeline after excavating the ground. It can scan 360 surface of the pipe. The depth of corrosion can be assessed through this method. Sensors of the e-pulse instrument are place along the pipelines. The quality of the pipelines is assessed using analysing sound waves. The condition of the pipe could be checked for 50 to 200 meters in a single shot. There is no need to dig up roads to conduct this test. The test will reveal the remaining life of the pipelines, structural strength and leaks,” the official explained. The corporation has identified as many as 12 locations across the 60 wards for the tests. “The test results from these locations will reveal the condition of 90% of pipelines. The locations were selected based on parameters like the age of the pipes, condition of soil and stress on the pipes including traffic flow and water pressure. We decided to test only at 10 locations as the two other locations fall under highly congested areas and we do not want to interrupt the traffic flow. We have completed the test at six locations and the remaining would be completed within a day. While the scanner is used at four locations including DB Road, KK Nagar and the corporation office, e-pulse is used at Nethajipuram and Varatharajapuram,” the official said. Data from the tests has been sent to the private firm and the officials are waiting for the report. The technology is being used in the country for the first time, the official added.